Go Ahead, Post a #Gelfie! * It cures in seconds, in contrast to the lengthy drying time of regular polish. * It lasts for weeks under normal conditions, whereas regular polish looks good for a few days. * You can get down with chemicals that would normally ruin regular polish (acetone, anyone?) and your nails will still look pristine. 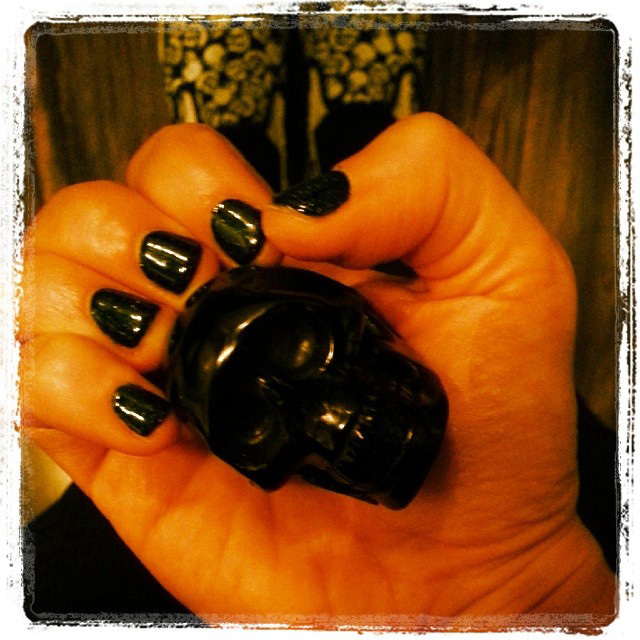 * Gel polish is *super* awesome at Feetish Spa Parlor, because you pay the same price for a mani or pedi whether you choose gel or regular polish. Unbelievable! 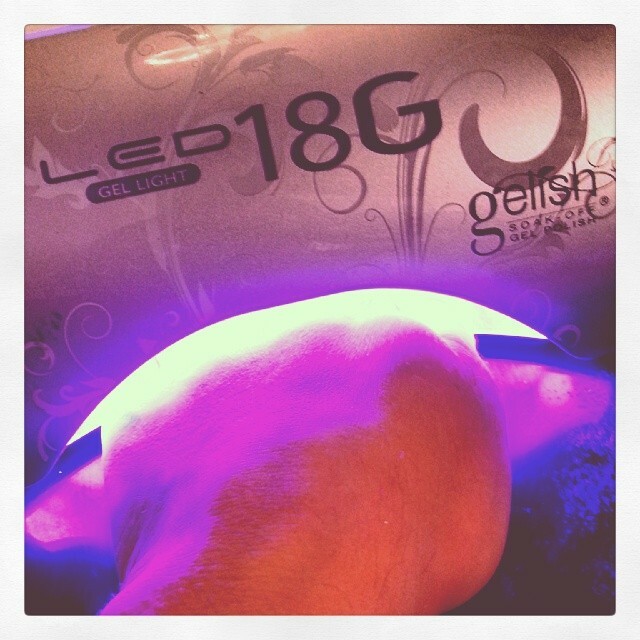 Gel polish is cured under LED light. Each coat takes about 30 seconds to cure. Once the top coat is applied, you can tie your shoes or pick your nose and your polish will still look perfect! My very own #gelfie! Not too shabby for doing my own left-handed gels. 😉 Colors: The Abyss (dark blue) with Fireworks glitter. If you have any questions about gel polish, manicures, pedicures, appointments or absolutely anything nail-related or not, please drop a note at feetishspa@gmail.com. This entry was posted in Downtown Las Vegas, Feetish Spa Parlor and tagged container park, crowd, crowdfunding, day, dermalogica, downtown, downtown las vegas, downtown project, dtlv, dtp, el cortez, emergency arts, essential, feet, feetish, Feetish Spa Parlor and tagged las vegas, foot, fremont, Fremont East, fremont st, fremont street, fremont street experience, funding, gel, gelish, golden nugget, graphic, harmony, holiday, ibd, incense, indiegogo, juhl, kuumba made, las, mack, mani, massage, national, neonopolis, nerd, novel, ogden, oil, oils, opi, parlor, pedi, perfume, podcast, polish, reflexology, salon, sandman, sell, soap, spa, superhero, vegas, zappos by feetishspa. Bookmark the permalink.